Blondie and Brownie: Happy St. Joseph's Day! St. Joseph's Day falls on March 19th which is always during Lent. Now remember the whole all meat and dairy products were forbidden during Lent in the olden days? Well, on a saint's day you have a special dispensation from the rules of fasting and abstinence of Lent. The proximity of St. Patrick's Day and St. Joseph's Day is one of many reasons why 'tis good to be both Irish-American/Italian-American. Take it from one who knows. Of the zeppole I've had in New York, I'm partial to the ones at Roccos. 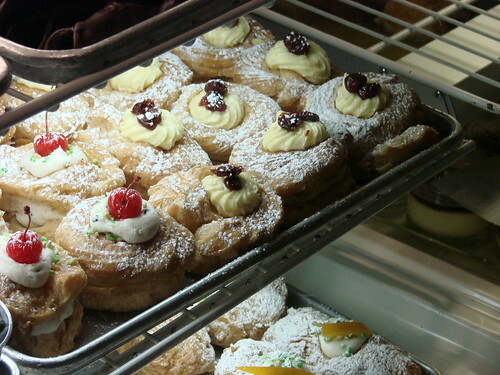 They have both the vanilla custard filled zeppole and the cannoli cream filled sfinge, either will run you $3.50 each. Personally I prefer the zeppole to the sfinge. 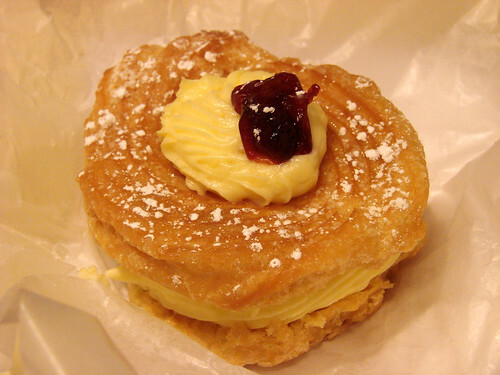 Growing in New Haven up my dad would always pick up a box of zeppole for St. Joseph's Day from one of the Italian bakeries downtown. Most of my family favors chocolate filled zeppole to vanilla filled ones, and to my great sadness I've not been able to find chocolate zeppole in New York. I've asked at Rocco's. I've asked at Veniero's. I've asked at Ferrera. I've asked at Villa Abate. They all look at me like I have two heads. I'll put the question to you, dear readers, has anyone ever encountered chocolate zeppole in New York? So great that you made light of zeppole! I grew up in Rhode Island and they were an annual tradition. But chocolate zeppole? Never heard of them, and I've had my fair share of zeppole.